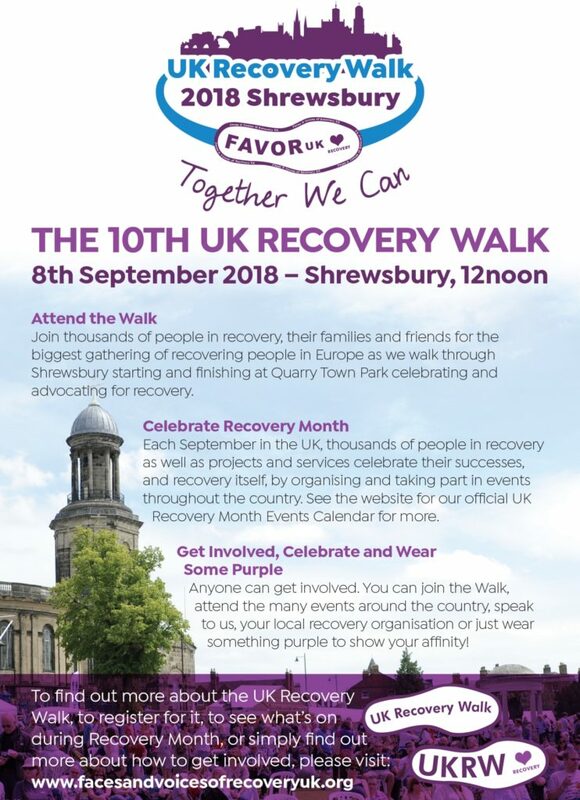 Shrewsbury in Shropshire were the winning bidders for the 2018 UK Recovery Walk. You can read their winning bid by clicking on the link below. We will update this page as more details are completed. Download this years poster by clicking on the link below. You can download the latests planning update which includes a map of the Walk Route here. 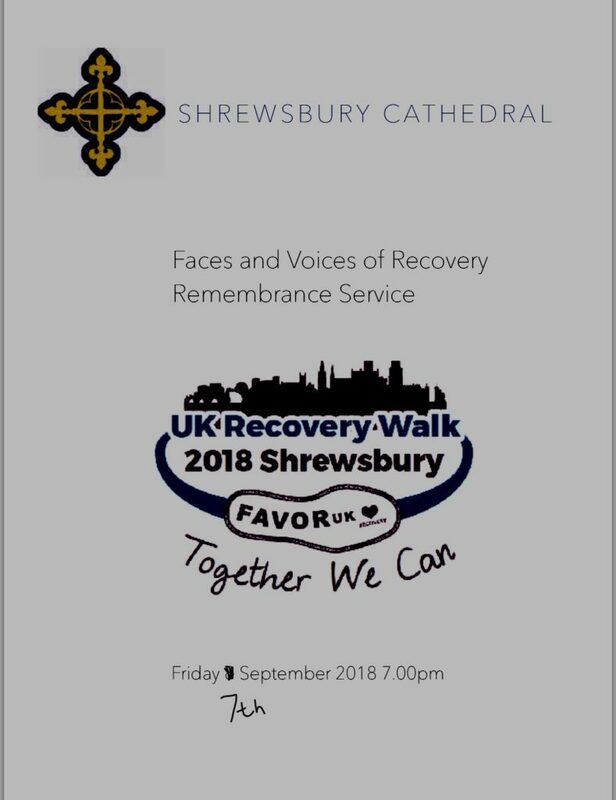 Also come & joins us free of charge for the Spiritual Service in the beautiful Shrewsbury Cathedral. Shrewsbury is a historic medieval town which makes it an attractive visitor location. It’s surrounded on three sides by the River Severn which means that transport into the centre can lead to some congestion and delays. How are you getting to the Recovery Walk? 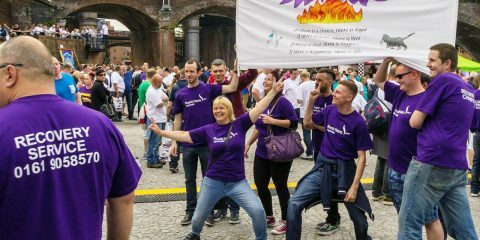 If you are travelling by coach on an organised group trip we have identified specific areas for parking for this event. This will allow us to ensure we park you quickly and efficiently as Shrewsbury has many one-way systems and this may hamper your arrival and parking especially for a coach. In addition, if required we can identify a drop off point if the nearest spaces to the event start point are already booked. Main roads into Shrewsbury are the M54 / M6 network or the A49, A5, A53, A458. There are several town centre car parks but these tend to get very busy particularly on Saturdays so please arrive in plenty of time. Shrewsbury has three park and ride sites around the edge of the town and is the cheapest way to get to the town centre. Wheelchair accessible buses operate on routes and normal charges apply. The nearest stops for the event are Barker Street and you can walk up a Claremont Hill by the Loopy Shrew Bar to The Quarry Park. Please alert the bus driver that you wish to disembark at this location. Anyone with a valid English bus pass will be able to travel on the Shrewsbury park and ride service for half the price – that’s only 80p return! The first bus is at 8am on Saturday. The nearest Bus Stop to the Shirehall is on Abbey Foregate on the opposite side of the road from the Shirehall. Please see the links to the timetables copy them into your search bar and they will work. The nearest rail station is Shrewsbury and it is about a 15-minute walk to The Quarry. Plan your journey here with National Rail journey planner or call 08457 48 49 50. Travel by bus and coach is stress-free and cost-effective. If you’re coming for a night out in Shrewsbury, don’t forget to book your journey home to avoid long waits.